Mr LalChand (Puriwala): In business for 2 months (relocated). Mr Dharmender (vegetable): In business for 10 years. Mob-9928476570. 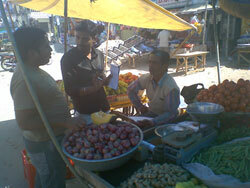 Mr Sankerji (vegetable): In business for 3 years. Mr Sankerlalji (vegitable): In business for 15 years. Mr Lilaramji (Tea stall): In business for 15 years. The basic or main problem is the illegality of business which means they have no authority to do the business in this market which makes them easy target for authorities to harass and extort. 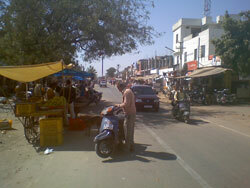 The relocation of the vendors is also a problem for the vendors. The vendors want to be relocated to a place where they can get more business or would like to continue the business at the same place but they are forced by the government to relocate and the vendors don’t have any other alternative which affects their earning greatly. For an example Mr. Lalchand used to run his vegetable business in Lalkothi market which was relocated to Muhanah market. Muhana, being inconvenient to him, he moved to Swarnpath market. Mr. Lalchand says that he used to make profit of around Rs 3500/- a day which has now reduced to only around Rs 500/-. The same problem is faced by many other vendors too. Another problem of the vendors is “Challan” issued to vendors. The amount of Challan ranges from Rs 100/- to 2000/-. Authorities also cease their weighing machine and issue them a Challan of around Rs 1600/-. A new weighing machine comes for lower price from that of Challan so no vendor goes to get their weighing machine from the authorities. 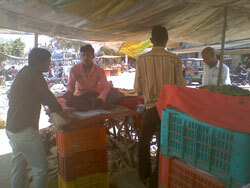 The street vendors accept that they are harassed by Municipal Corporation. The vendors do not pay any extra money to anyone but to the government authorities. But some times to avoid all legal procedures they bribe the Police or Officials of authorities. For around 15 years ago Swarnpath Market was tried to shift from street to a park of the colony but it couldn’t be possible because of clash between Municipal Corporation and Development Authority. Most of the vendors are still ready to relocate to some other place the only condition they put is the viability of market.